In 1924, prominent Los Angeles physician Dr. Walter Jarvis Barlow and his wife, Marion Brooks Barlow, began building their dream house in the foothills of the San Gabriel Mountains– the home that would eventually become the Villa del Sol d’Oro. Dr. and Mrs. Barlow, both originally from New York and both members of prominent society families, moved to Los Angeles in 1895 after Dr. Barlow contracted tuberculosis. At the time, it was believed that a sunny and dry climate would help to alleviate the progressive effects of the disease and would allow Dr. Barlow to continue his research. The couple was married in 1898 at St. John’s Church in Los Angeles and had three children: Walter Jarvis Barlow, Jr. (1900-1965), Catherine Lent Barlow (1901-1964), and Ella Brooks Barlow (1905-1994). In 1902, Dr. Barlow founded the Barlow Sanatorium in Echo Park to meet the needs of patients suffering from tuberculosis. The sanatorium would be his life’s work and a testament to the treatment of the disease in the early part of the 20th century. Today, the Barlow Respiratory Hospital is a long-term acute care facility in Los Angeles that specializes in respiratory diseases. Although the location of the sanatorium was ideal for air flow and exposure to the natural elements it provided, Dr. Barlow and his wife sought a more private place of refuge from the early hustle of Los Angeles. In 1924, Dr. and Mrs. Barlow purchased a 13-acre property at 675 West Highland Avenue in Sierra Madre. To create his vision of an Italian villa, Dr. Barlow hired notable Pasadena architect Wallace Neff. Well-known in the Los Angeles area, Neff was the designer of Pickfair and the Gillette Mansion, as well as an architect to many of Hollywood’s earliest stars. Through a collaboration with Dr. Barlow, Neff designed the Villa del Sol d’Oro, which was completed in 1928. The Villa is a two-thirds scale replica of the Villa Collazzi near Florence rumored to have been designed by Michelangelo. Wanting to integrate elements of his own architectural style, Neff included an elegant black and white checkered floor in the foyer as well as a curving staircase with a wrought iron banister that are now considered to be signature facets of Neff’s design style. 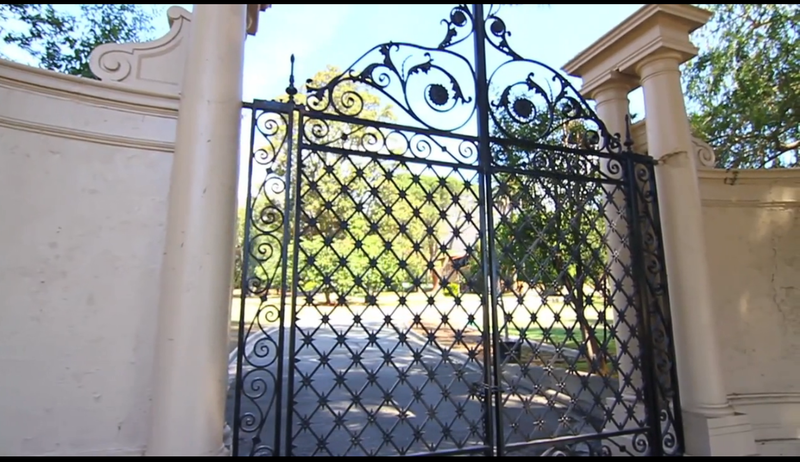 During the time the Barlow family called the Villa home, they hosted lavish parties, entertained guests from around the world, and enjoyed the seclusion the expansive property provided them. A fan of books, dogs, and medicine, Dr. Barlow spent the majority of his time studying and conducting research in the library. After battling tuberculosis for over 30 years, Dr. Barlow passed away in 1937. Marion was faced with the difficult decision of remaining at the Villa del Sol d’Oro or selling the property. With her children grown and the care of the property becoming overwhelming, Marion sold the Villa and property to the Sisters of St. Francis in 1942. She retired to the Huntington Hotel (presently The Langham Huntington Hotel) where she passed away in 1964. Today, the Villa del Sol d’Oro serves as an important part of Alverno life. It is not uncommon to find the photography class taking pictures on the terrace or find a creative writing class creating a story about one of the Barlow’s many parties. Alverno’s two choirs, Concert Choir and Alverno Singers, practice upstairs, and the upstairs ballroom is perfect for our pilates class. Additionally, the Villa serves as the location for Alverno’s Winter Formal; our annual Christmas Candlelight Celebration; and of course, it is the perfect location for the Festival of Haunts. However, the Villa is not just a site for classes and activities at Alverno, but it has also been a location for television and movie productions as well as the perfect backdrop for print publications. Movies and television shows filmed at Alverno include Beverly Hills 90210; Bones; Columbo; Corrina, Corrina; CSI Miami; Legally Blonde; MacArthur; Marvel’s Agents of S.H.I.E.L.D. ; The Master of Disguise; Mommie Dearest; The Princess Diaries; Passport to Paris; Poison Ivy; The Secret War of Harry Frigg; Sweet Bird of Youth; Uptown Saturday Night; and A Walk in the Clouds. The Villa has also been featured in Seventeen and Vogue as well as print advertisements for Vera Bradley, Ralph Lauren, and others. Alverno is fortunate to have this historical landmark as a part of our campus.